Waiving the mortgage contingency clause when buying a property in NYC can sometimes be the only way to compete with all-cash or non-contingent buyers. In this article, we define and explain the concept of a mortgage contingency clause as well as the risks of waiving the mortgage contingency when submitting an offer on a home in NYC. What is the definition of a mortgage contingency clause? A mortgage contingency clause in a NYC real estate contract gives the buyer the right to back out of a deal and recoup his/her deposit in the event that he/she is unable to obtain financing within a specified period of time. This contrasts with a deal where there is no mortgage contingency, under which the buyer is still responsible for coming up with the remainder of the purchase price at closing even if the bank does not agree to provide a loan. The mortgage contingency clause is meant to protect a buyer’s deposit and safeguard his or her ability to back out of the deal if for some reason the bank ultimately declines to provide a mortgage. While the language of each mortgage contingency varies by deal, a mortgage contingency clause in NYC will usually only permit the buyer to back out and recover the deposit if he/she does not directly cause the financing to fail through some act of bad faith. The buyer must agree to apply in good faith for the loan within some specified time period after the receipt of a fully executed contract. The buyer must fill out the loan application in a truthful and accurate manner and furnish all information required by the lender. The buyer must comply with all terms presented by the lender as part of the loan application process. The buyer cannot borrow more than what is specified in the mortgage contingency. A mortgage contingency clause in New York also usually protects a buyer against having to come up with the funds for the purchase in the event that a bank won’t lend as a result of a dispute with the co-op corporation. Because buyers of co-ops in NYC are purchasing shares of a corporation as opposed to real property, the traditional means of protection for the lender do not exist. As a result, before extending a loan the lender must have a ‘recognition agreement’ in place with the co-op. This agreement gives the Institutional Lender protection in the event the buyer is unable to meet the payment terms of the loan. As soon as a buyer receives his or her loan commitment letter, he/she must proceed with the deal and is no longer able to activate the contingency, back out of the deal and recover the contract deposit. Why do buyers in NYC often waive the mortgage contingency clause? It’s no secret that New York City real estate is considered of the most treasured assets in the world. As a result of limited inventory and tremendous demand, the New York City real estate market is extremely competitive for buyers. Although they pay the highest real estate commissions worldwide, sellers in NYC are therefore in the privileged position of having a large number of prospective buyers to choose from. As the above list suggests, the typical working professional in NYC who needs a mortgage to complete the purchase is relatively low on the pecking order of offer competitiveness. Therefore, buyers often consider waiving their mortgage contingency in order to make their offers more competitive with those of all-cash and/or non-contingent, financed buyers. With that said, waiving a mortgage contingency will still not make an offer as attractive as an all-cash one because all-cash deals close 30-60 days faster. The only reason to waive your mortgage contingency is if you are bidding on a competitive listing against other buyers who are financially stronger. However, not all listings will be highly competitive situations. 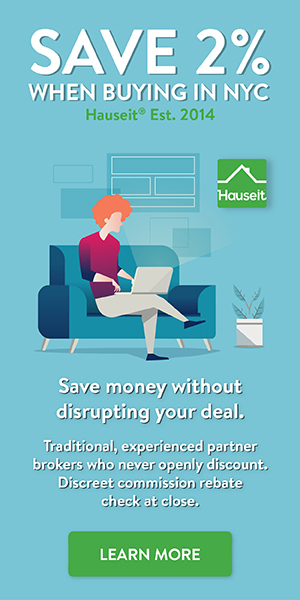 If you are receiving a NYC buyer’s broker commission rebate and working with a seasoned NYC buyer’s agent, he/she will be able to glean intel from the listing agent and determine the exact nature of the competition you are up against. Broker commission rebates in NYC are an automatic and completely legal way to save money when buying a property in NYC. Better yet, rebates are considered to be non-taxable income and encouraged by New York’s Attorney General. If you are fortunate enough to be interested in bidding on an older listing which was initially mis-priced and has floundered on the market, the chances are there you will be one of only a handful of seriously interested parties. Your buyer’s agent will be able to advise you as to whether or not you will gain any advantage by waiving your mortgage contingency. If there are no other competing bidders, the seller is unlikely to be in a position where they can credibly ask you to waive your mortgage contingency. Why do sellers in NYC disapprove of mortgage contingency clauses? Sellers in NYC are often averse to doing a deal with a mortgage-contingent buyer because there are usually lots of buyers to choose from. If the market is strong and a seller has multiple offers, there is a large ‘opportunity cost’ and risk for the seller to go with the mortgage contingent offer over an all-cash offer, even if the financed buyer’s offer price is marginally higher. If a seller signs a contract with a mortgage contingent buyer and the clause is ultimately activated, it means that the deal falls apart and the seller has lost 30-60 days of precious marketing time. Therefore, sellers often view the potential to take a buyer’s deposit as fair and just compensation for the potential loss of time and momentum on a deal if the buyer is unable to successfully receive a loan. What are the risks of waiving the mortgage contingency clause on a NYC real estate deal? If you are about to make an offer in a competitive bidding situation, waiving the mortgage contingency clause is not something you should consider lightly. Failing to obtain a mortgage within the contingency period, or allowing the contingency period to expire will eliminate your right to recover your deposit and back out of a deal. Therefore, it will obligate you to proceed with the deal so as to avoid a breach of contract. If you are unable to come up with the remaining funds for the purchase, you will default under the contract and forfeit your deposit to the seller. Considering how expensive properties are in NYC, this could result in a loss of $100,000 or more. That is one seriously expensive mistake. However, the real reason why you should think carefully before waiving your mortgage contingency is that there are a tremendous number of potentially unpredictable variables which could potentially derail your mortgage application. If your lender happens to suddenly change their underwriting criteria or you suffer a job loss, you could be on your way to a unexpected mortgage rejection. With that said, if you happen to have a backup source of proceeds (perhaps a gift from a friend or family member) then it’s obviously less risky for you to waive your standard mortgage contingency. How can I minimize my risk if I’ve decided to submit a non-contingent offer? The reality is that if you are already pre-approved by a major bank and have confirmed with them that your building is on the list of approved buildings, the chances are remote that you will not receive a loan. If the bank has approved you but not your building, they should be able to tell you whether or not the building will be approved before you commit to signing the contract. If you are competing aggressively against an all-cash and/or non-contingent offer but not willing to forego the entire mortgage contingency, you could break down the contingency into a few components in order to effectively manage risk while making your offer as competitive as possible. Let’s say that you are comfortable with your own financial profile but unwilling to take the risk that your lender won’t approve the building. In a scenario like this, you could perhaps assume the underwriting risk on yourself while preserving your right to back out and recoup your deposit if the lender finds an issue with the building. As a sweetener to the seller, you could even agree to bear the financial risk of a low appraisal provided you have a backup plan for making up the shortfall (we discuss this in more depth below). What other specific types of contingencies exist? As a buyer, there is always a risk that the appraised value of your purchase may come in below the contract price. The mortgage contingency clause in your contract will include language which explains what may happen under this scenario. If, for example, you are in contract to purchase a $2m apartment and the mortgage contingency is for 80% of the sale price, you will not satisfy the contingency unless the bank agrees to lend you $1.6m. If the appraisal comes in at $1.9m and assuming the bank is lending at 80% LTV (loan to value), this means that there will be a shortfall on your loan commitment of $80,000. As a result, your mortgage contingency will not be satisfied and you will be able to recoup your deposit and cancel the deal. Having an appraisal contingency as part of the mortgage contingency will obviously make your offer less attractive to a seller. As we mentioned previously, you could always agree to waive the specific appraisal contingency component of the mortgage contingency if you have sufficient financial reserves to make up the shortfall. Under a funding contingency, a buyer’s deposit is protected in the event that the lender approves the buyer but ultimately decides not to lend because of a building, appraisal or some other issue which is not directly related to the buyer’s financial profile or the fault of the buyer. In other words, as a buyer your deposit is protected in the event that your bank pulls out of the deal and ultimately decides not to give you a loan even after they’ve approved your application and extended a mortgage commitment letter. While this provision is obviously highly beneficial as a risk mitigation tool for buyers, it’s less attractive for sellers because it gives the buyer an additional ‘out’ under the contract. A typical NYC mortgage contingency can be either an active mortgage contingency or a passive mortgage contingency. Under an active mortgage contingency, the buyer has control over the contingency itself and must release it in order for the deal to proceed. This is different from a passive mortgage contingency, under which a buyer will automatically waive the contingency if he/she does not take a specific action as outlined in the contract in order to trigger the contingency and be permitted to back out of the deal. Because they expire automatically, passive mortgage contingencies are risker for buyers and obviously preferred by sellers. 19.4 In order to cancel pursuant to Par. 19.1 or 19.3, Purchaser shall give Notice of cancellation to Seller within 7 business days after the right to cancel arises. Purchaser’s failure to timely give such Notice of cancellation will be deemed a conclusive waiver of such right to cancel. Under a passive contingency, the buyer must provide notice of mortgage contingency activation within a specified period of time. If no notice is provided, the mortgage contingency will automatically expire and the deal will proceed. A passive contingency usually requires that the buyer furnish specific documentation, including a copy of the loan application and commitment letter (if applicable) along with the notice of cancellation itself. It’s also important to examine the specific language in the proposed mortgage contingency section of the contract for any onerous fee and/or interest rate terms. For example, a seller’s attorney may include language in the contingency which obligates you as the buyer to accept any interest rate from a specified lender if no traditional financing options exist. 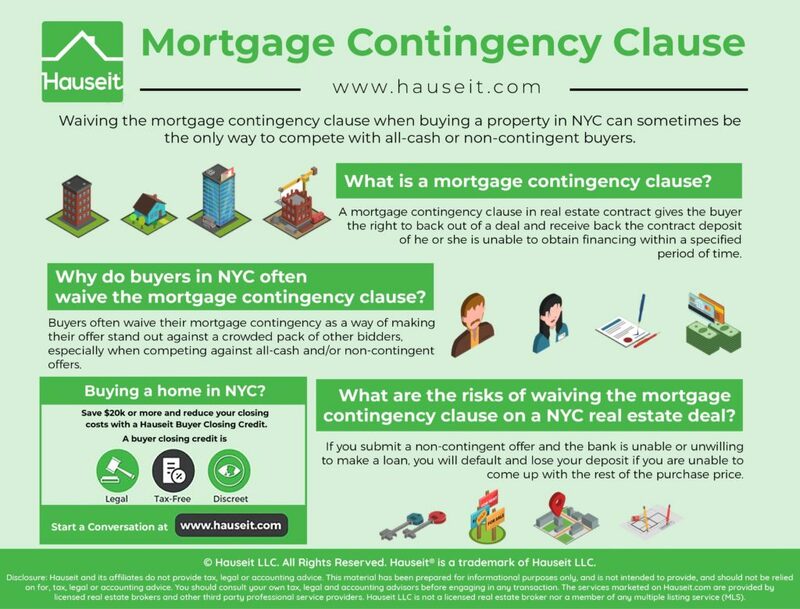 What is a sample mortgage contingency clause in New York City? Amount Financed: $1,100,000.00 or any lower amount applied for or acceptable to Purchaser, but not in excess of this amount set forth herein unless specifically agreed to in writing in advance by the seller. Payment Terms and Charges: The customary payment terms (including prevailing fixed or adjustable interest rate, prepayment provisions and maturity) and charges (including points, origination and other fees) then currently being offered to purchasers of cooperative apartments by the Institutional Lender (defined in Par. 19.5.1) to which Purchaser applies. 19.1.2 the Institutional Lender and the Corporation cannot agree on the terms of an agreement for the protection of the Institutional Lender (commonly called a recognition agreement), if required by the Institutional Lender, provided that the Institutional Lender shall agree to accept the “Aztech” form of recognition agreement. 19.2.3 Purchaser must comply with all requirements of the Institutional Lender to obtain the Loan Commitment Letter and to close the Loan. 19.3.3 Purchaser is unable in good faith to obtain from the Institutional Lender an extension or a new Loan Commitment Letter for the Amount Financed stated in Par. 1.16 or the same principal amount stated in expired Loan Commitment Letter, whichever is lower, without paying any additional fees to the Institutional Lender (unless Seller, within 5 business days after receipt of Notice of such fees, gives Notice that Seller will pay such fees and pays them when due). All other substantive Loan terms may be materially no less favorable than in the expired Loan Commitment Letter. 19.4 In order to cancel pursuant to Par. 19.1 or 19.3, Purchaser shall give Notice of cancellation to Seller within 7 business days after the right to cancel arises. Purchaser’s failure to timely give such Notice of cancellation will be deemed a conclusive waiver of such right to cancel. In case of cancellation pursuant to Par. 19.1, a copy of the loan application and any commitment Letter (as the case may be) issued by the Institutional Lender shall accompany Notice of cancellation, if available, or if not then available, shall be provided promptly after receipt. In case of cancellation pursuant to Par. 19.3, a copy of all written communications between the Institutional Lender and Purchaser concerning the extension or new loan commitment shall accompany the Notice of cancellation (or a copy of any letter refusing to extend the loan commitment or make a new loan commitment received by Purchaser after sending the cancellation Notice shall be sent to Seller promptly after receipt. Purchaser’s obligation under this Par. 19.4 shall survive the cancellation of the contract. 19.5.2 a “Loan Commitment Letter” is a written offer to make the Loan with or without recourse, and whether or not conditional upon any factor other than an appraisal satisfactory to the Institutional Lender. An offer to make the loan which is conditional on obtaining a satisfactory appraisal shall only become a Loan Commitment Letter upon such condition being met. 19.6 Notwithstanding anything contained herein to the contrary, Seller may, at Seller’s sole option, upon receipt of a Notice of Termination, reinstate this Agreement by offering financing to Purchaser on the terms and conditions sought by Purchaser, and for which Purchaser was rejected. All other provisions, such as amortization schedule, interest rate, payments, costs and expenses shall be the same. Which Home Buying Contingencies Actually Matter?